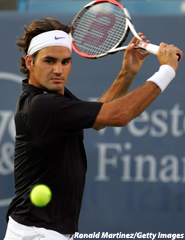 MASON, Ohio (AP) -- Top-ranked Roger Federer handily beat qualifier Julien Benneteau 6-3, 6-3 Wednesday night at the Western & Southern Financial Group Masters in a match devoid of surprises. Losses by Rafael Nadal, looking nothing like the second-ranked player in the world, and Novak Djokovic, who last week beat the top three players in the world, marked a day of upsets and injuries. Benneteau, of France, held serve in three games in each set, as Federer did nothing flashy but seemed to rattle Benneteau whenever Federer chose to go to the net. Federer said it was a continuation of the way he played last week in Montreal. Earlier, Nadal -- his right knee wrapped and his left wrist aching -- retired in the second set of his match against Juan Monaco of Argentina. Fourth-seeded Djokovic, who beat Andy Roddick, Nadal and Federer en route to winning the Rogers Cup in Montreal -- the first time anyone beat the world's top three in a tournament since Boris Becker did it in 1994 at Stockholm -- fell to Carlos Moya 6-4, 6-1. Indeed, he never looked comfortable in the early going, barely managing to hold serve twice. He failed to win a point in his third service game, hitting game point off the edge of his racket into the stands. Nadal had been bothered by a sore right knee since his Wimbledon final loss to Federer. He said nothing before Wednesday's match that indicated any problem with his wrist or arm. Nadal began to look like himself in the eighth game, serving well and dominating. He then broke Monaco to get back on serve, running Monaco from side to side and scoring on two brilliant passing shots, one of which sent Monaco diving to the court in a wild attempt to save a point. Nadal seemed to be in complete control -- until the tiebreaker. After losing that, he took an injury timeout to have his left wrist and forearm massaged. Ice was applied to try to relieve the cramping. When play resumed, Nadal didn't win a point in failing to hold serve, and failed to hold again in the fifth game, weakly hitting game point into the net. Federer said he was surprised the Nadal and Djokovic were gone so soon. But their departure doesn't improve his chances of winning his 50th tournament this week, he said. Earlier, Australian Lleyton Hewitt, who needed nearly three hours to beat Stanislas Wawrinka in his first-round match, was on the court only 51 minutes against eighth-seeded Richard Gasquet. Hewitt won the first set 6-1 and was leading 3-2 in the second when Gasquet retired due to a blister on his right hand. In Djokovic's case, it was a matter of failing to hold serve once in the first set, then falling apart completely. He hit just 36 percent of his first serves in the second set and double-faulted four times. Even though the top eight seeds got first-round byes this year because of the back-to-back ATP tournaments in Montreal and Cincinnati, Djokovic said it wasn't enough time off. Altogether, six seeded players were beaten Wednesday, joining three already gone. Juan Carlos Ferrero of Spain beat sixth-seeded Fernando Gonzalez of Chile 6-2, 7-6 (7); Nicolas Almagro of Spain beat 11th-seeded Ivan Ljubicic of Croatia 6-4, 6-4; Sam Querry beat 13th-seeded Mikhail Youzhny of Russia 5-7, 6-3, 6-4. Among the seeded winners, No. 16 David Ferrer of Spain beat Radak Stepanek of the Czech Republic 6-2, 7-5; No. 9 James Blake beat Nicolas Kiefer of Germany 6-4, 6-4; No. 11 Tomas Berdych of the Czech Republic beat Arnaud Clement of France 7-6 (1), 7-6 (4); and No. 5 Nikolay Davydenko of Russia beat Robby Ginepri 6-2, 6-7 (7), 6-3.